It started with a phone call. Trisaetum winemaker James Frey was boarding a plane in Chicago on his way back home to Oregon's Willamette Valley. Chris Figgins, a winemaker friend from Leonetti Cellars and Figgins in Washington, was calling to ask if James would be interested in trading some Pinot Noir from his Ribbon Ridge Estate vineyard for some Cabernet Sauvignon, Merlot and Petit Verdot from Figgin's vineyards in Walla Walla. The cabin door was shutting, so James told Chris he'd call back when he landed in Oregon. James was intrigued. He'd always loved the bold, espressive Bordeaux-style wines coming from the Walla Walla Valley. In particular, he loved the wines crafted by Chris from his various vineyards. As the plane departed, James pulled out his notebook and began jotting down ideas. He knew Pinot Noir--the finicky grape that, when done right, produces wines of elegance, nuance and grace. So, what would he do with the power and intensity of Cabernet Sauvignon and Merlot? There was no reason to make a Bordeaux-style proprietary red blend in the same fashion as the great winemakers of Walla Walla; it had already been done...and quite frankly, done really well. But as he thought about it more, James wondered whether his particular Pinot Noir background could contribute to crafting something unique, something different, something special from this world-class fruit. Once at cruising altitude, ideas began to take shape in his mind. He could crush by hand. He could ferment the fruit in small lots in open-top vats. He could employ hand punch-downs to carefully manage extraction. He could age the wine in his Burgundian casks. He could, in essence, bring the soul of Pinot Noir to a Bordeaux-style blend. When the plane landed 3 hours later James immediately called Chris. 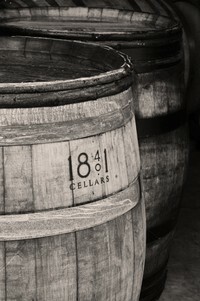 He was in…and 18401 Cellars was born. The fruit for 18401 Cellars is grown in some of Walla Walla’s best known vineyards; fruit directly controlled and managed by Chris Figgins. All of the picking decisions are made in consultation between Chris and James as harvest gets underway. When the ideal conditions are reached, the grapes are hand picked by Chris’s team in Washington and are immediately transported the 4 hours to Oregon. When the fruit arrives at James’s winery in Oregon’s Willamette Valley, it is chilled overnight to help ensure the integrity of the fruit as it moves through the processing line. 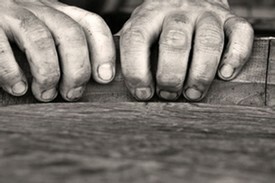 Instead of using a machine to crush the berries, 18401 Cellars employs a hand-crushing process undertaken by six individuals. Hand-crushing the grapes allows for a very exacting level of berry breakage before fermentation begins. The fruit is then placed in small open top fermentation vats, typically made of French oak. During the fermentation process, the fruit is punched down by hand to regulate levels of extraction. James tastes the ferment twice a day in order to assess the levels of color and tannin, as well as the overall balance of the wine. Adjustments to the punch-down regimen are made throughout the fermentation process. When an ideal balance of tannin extraction is achieved, the wine is pressed off and allowed to finish its fermentation in tank or in barrel. The wines of 18401 Cellars are then aged for a period of 18-22 months in an underground cellar inside Burgundian casks, hand-crafted of French oak sourced from the forests of Nevers and Limousin. Per our specifications, the casks are customized with a subtle toasting protocol, infusing layers of delicate complexity into the wines as they age. The casks are gently racked several times throughout the year, removing sediment in the process. 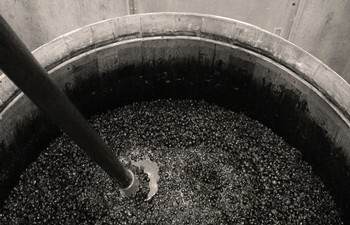 After the first year, the wine is thoughtfully blended before returning to barrel to age for another year. James has always believed that you need science to make a good wine, but that you need art to make a great wine. 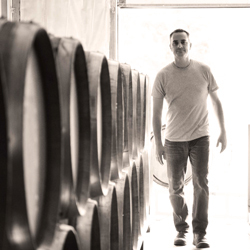 His approach in hand-crafting the wines of 18401 Cellars has been guided by this philosophy. In winemaking, there are brix measurements, malic acid and pH measurements, analysis of yeast assimilable nitrogen, and countless other scientific protocols to follow: the formula for winemaking, so to speak. And the science is absolutely necessary to make a good wine. But truly great wines come from art. They come from the winemaker’s palate and the ability to blend each of the component parts into an alluring expression of complexity and balance. They come from creative inspiration and passion. 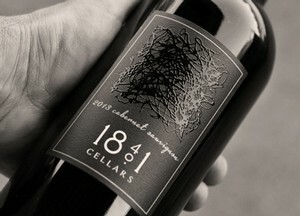 The unique label of 18401 Cellars pays homage to this philosophy of uniting science and art by featuring one of James’s original drip paintings. As one who embodies the fusion of science and art, when he is not busy creating the wines of 18401 Cellars, James can be found in his studio painting for collectors around the world.